The Dow hit 20,000. That doesn't mean Trump is making the economy great again. The Dow Hit 20,000. That Doesn’t Mean Trump Is Making the Economy Great Again. Good for him. But good for you? #DOW20000 "Trump would ruin the economy"
So never mind the lowest approval ratings of any new president since pollsters began keeping track. Boys just want to make money! Will it last? I don’t make predictions. But unless you can afford the really good stuff, resist getting out the Champagne. The Dow is not a proxy for the overall economy, and Donald Trump’s plan to make our personal finances great again is so far an unproven assertion. Even if Dow 20,000 does last, it probably won’t help you. 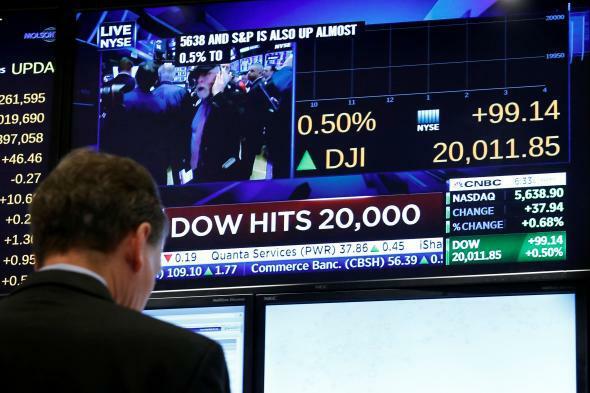 So on one profound level, Dow 20,000 is an exciting achievement. It’s certainly unexpected. Many predicted stock-market doom when Donald Trump won the presidential election, only to see the markets soar into record territory over the next four weeks, something the financial cable networks quickly dubbed the “Trump bounce.” Then the markets retreated somewhat—until earlier this week when investors, likely excited by the prospects of tax cuts, business-friendly regulation, and increased infrastructure spending, sent the Dow skyward. But Dow 20,000 doesn’t mean you made money, or much of it. According to Gallup, only about half of Americans are even invested in the stock market. The middle class is less likely to do so now than it was prior to the Great Recession, when almost three-quarters told Gallup they put money in equities (only half do now). And how much does the middle class invested? Not much. Let’s use retirement savings as a gauge, because when most people invest in the markets, it’s there. Vanguard reports the median 401(k) account balance in 2015 was a lowly $26,405. So who is making money as a result of Dow 20,000? Last December, Thomas Piketty, Emmanuel Saez, Gabriel Zucman released their latest data on how income inequality plays out in the United States. The big reveal: The earnings of the fabled 1 percent are increasing over the rest of us, in large part, because they earn more money on investments than we do. In their working paper, the three researchers show how the surging fortunes of the 1 percent in the 1980s and 1990s was indeed driven by outsized salary increases, which is what most of us think about when we contemplate income inequality. But that changed around the millennium. Over the past 15 years, much of the continued earnings growth for this cohort has been fueled by their stocks, bonds, and other investments. “It looks like the working rich who drove the upsurge in income concentration in the 1980s and 1990s are either retiring to love off their capital income or passing their fortunes onto heirs,” Zucman wrote in an explanatory post published on the Washington Center for Equitable Growth’s blog. Meanwhile, the better-paid among us often have more opportunity to grow money effectively. The Institute for Policy Studies outlines one way this works in a recent paper, “A Tale of Two Retirements.” For those with access to a defined contribution plan like a 401(k) at work, the law puts a hard stop at $18,000 on annual contributions for employees younger than 50, and permits them an extra $6,000 if they are older, no matter how much they earn. The vast majority of Fortune 500 companies, however, set up other of tax-deferred retirement accounts, known as supplemental executive retirement plans, for executive-suite employees. There are no limits on contributions to these investment vehicles. No surprise: There’s lots of money in these accounts. When the IPS researchers looked at SEC filings, they discovered Glenn Renwick, the president and chief executive officer at Progressive Insurance, had a cool $194 million socked away. In fact, the 100 largest CEO retirement funds were worth $4.7 billion. That’s equal to a little more than half of the total retirement savings of households headed up by women. In other words, our issue isn’t simply income inequality, but also wealth inequality. Personal-finance scolds like to remind us that investing is about the value of compound interest, the idea that your money grows over time. Forgo spending $5 a day on a latte, they say, and you can retire a millionaire. But what they rarely mention is that the magic of compound interest is even greater for those with more money from the get-go. Someone with $5,000 to invest isn’t going to earn as much as someone who has $50,000 to invest, who isn’t going to earn as much as someone with $500,000. And Dow 20,000, as thrilling as it sounds, will do nothing to change that reality. *Correction, Jan. 25, 2017: This post originally misstated that the Dow Jones Industrial Average opened at 20,000. It hit that number shortly after opening.